Hi, nice to see you all. I’m a trader with 6-year forex trading experiences. 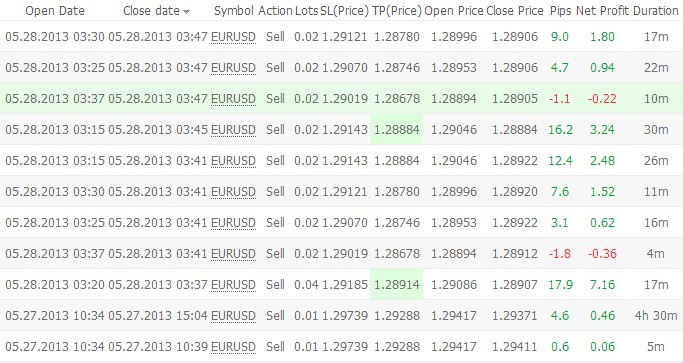 I focus on EUR/USD, GBP/USD, AUD/USD and XAU/USD mainly. I'm new to this forum and learning trader. is it a scalping EA? Question, are you going to share your systems? What is the purpose of posting these? You have posted this in five different areas of the forum and your intentions are unknown. I don't sell EAs but if you're interested I may consider sharing with you. I just wanted to show my performances and hope you can share your trading ideas too. The EAs trade on small trend and trend continuation on small timeframe. I don't think you understand. Why are you posting results here if you don't plan on sharing. I don't have enough time to waste here. Profitable EAs never be shared or sold. Profitable EA's should be shared here. You were asked to stop flooding our forum with your performance and to share it. Don't pout and have an attitude because you were told not to spam us. You should know the concept of forex forums by now. We had a feeling you were going to spam us, I guess we were right. I tried hard to improve my EAs every day. I'm not a philanthropist. It seems that you really enjoy chatting with members here. Could you please show me the rules of the forum interms of that, which would be much more direct and convincing.